Throughout this website we provide tools for sleep help. Restorative sleep is the key to any other protocol for fibromyalgia symptoms management. There may be more than 13 reasons why you can't sleep if you suffer with fibro as I do, but these are some of the more common. We believe in utilizing the least invasive solutions to this universal fibromyalgia issue. 1. The number ONE reason you cannot sleep is that Fibromyalgia is complex and involves many systems within the body. The nervous system and endocrine system are responsible for adaptation to our inner body clock and circadian rhythm. The fibro body does a 180 in this department and has a more difficult time winding down at night. Sometimes the fibro person actually feels more awake and alert at bedtime than at any other time of the day. In fact, the lack of non-restorative, REM sleep often leads to morning stiffness and increased pain for many, if not most fibro sufferers. We have to work diligently to not get caught in this vicious cycle. 2. Adrenal stress and cortisol imbalance can be an issue with any chronic illness. Fibromyalgia presents an additional challenge due to the many variables that can cause undue stress on the body. When the adrenal glands are constantly fighting pain and symptoms, they cannot do their original job of counteracting daily stressors and keeping the “fight or flight” system in balance. 3. Not getting enough exercise can affect sleep, as the body is naturally meant to move and expend a certain amount of energy every day. We know that safe and effective exercise is necessary when living with fibro, yet when other conditions or exacerbating factors are present, we may need to get more creative. Find exercises that work for you. Check the Fitness articles here in the site for guidelines on working out with fibro to get some excellent sleep help. As a practitioner/fitness trainer living with FMS/CFS/MCS almost four decades, I understand the challenges. Our goal is both safe and effective exercise while working to avoid post exercise malaise. Incorporating modified yoga moves before bed can provide sleep help, but avoid extended sessions of stretching. Tai-chi or Qi-gong can help to balance more intensive exercise and also aid in better sleeping patterns. Along with safe exercise, another consideration is using an infra-red sauna a few times a week. This helps to relax the body and reduce levels of pain. I use one here and I find that utilizing the sauna before bed is one of the most relaxing things we can do, as long as we go slow. If you do not have access to an infra-red sauna, any sauna will do, or check out the infra read sauna below, one of the most cost effective portable infra-red saunas available. If that is not feasible, check in your area at a gym or fitness center. 4. Nightly “second winds” can become habitual. This will again over stimulate the adrenal glands and continue to cause disruption in the circadian rhythm. Late night television or surfing the internet can easily affect sleeping patterns by disruption in melatonin made naturally by the body. Serotonin and Melatonin are well known to be disrupted in many fibro patients. Staying awake and stimulated too long after sun down is not natural to the body. Nature creates optimal balance through light and darkness. Until 150-years ago, we were a primarily rural, farming society going to bed at dark and arising at daylight. This had gone on for eons and our bodies are still wired for it. Now, with artificial light and TV entertainment, we ignore our “wiring”, our bodyclock. 5. Over dependence on sleep medications can not only cause side effects from the medication itself but can create an inability to sleep naturally and with higher doses, the medication will be less effective with long term use. Some sleep meds like Ambien have come under fire for more adverse side effects. When taking a sleep medication always take the Lowest Effective Dose, as we talk about on the Body Clock article. A sleep help tip is to buy a pill cutter. Using sleep meds while adhering to a firm schedule is the best and most effective way to use sleep medications as they are only intended for short term use anyway. In fact, most doctors will only give short term prescriptions because of the fact that these meds were only created for short term use. Deep breathing techniques can be helpful before bed. Keep working at it. I often do some deep breathing when I cannot sleep. Pull the covers up, form a tent over your head, and do some nice breathing. If nothing else, your body gets better oxygenated. 6. Eating too many “concentrated” foods/proteins after 3pm can inhibit sleep while the digestive system is busy “working” overtime. On the Nutrition Tips article page, I give suggestions for breakfast, lunch and dinner for this reason. We are best to eat less concentrated foods such as animal protein and anything that will take longer to digest at dinner. At lunch time, we naturally have more “digestive fire” and bile salts to properly breakdown and assimilate these more concentrated foods. Being constipated can also contribute to insomnia. As a colon therapist, I often see this correlation. This creates a cycle because when we do not sleep properly, the elimination organs cannot do their jobs. So lack of sleep can cause constipation and being constipated can in turn cause the body to be unable to sleep when toxicity and fullness in the GI tract cause additional symptoms, pain and fullness. 7. Wireless radiation in the house and in close proximity can keep the fibro body over stimulated. It can be helpful to “hardwire” computers that you spend more time on and limit time on cell phones. Smart meters on homes can also pose a problem as they generate large amounts of electro-magnetic radiation. I have always been ultra-sensitive to radiation and EMF in the environment. We got rid of our “smart meter” on our home and had the power company replace it with the old analog meter. In fact, if you have tinnitus or even occasional ringing in your ears, this could be a factor to consider, as EMF’s in our environment can contribute to this. Also, keep the bedroom free of as much “electricity” as possible. This means TV, radio, cell phones, computer, etc. 8. A snoring spouse is very disruptive to optimal sleep and regeneration. If your spouse or other family member snores, you may need to work out an optional sleeping arrangement if at all possible. My husband and I have had separate bedrooms for many years. I have fibro and he snores. This is not a good combination. This is not about wants, this is about needs. We must be assertive about our needs, especially when it comes to sleep and regeneration. What do we say in the Body Clock article? Sleep is NUMBER ONE! So, always work with your spouse and compromise in other areas if needed, but not here. The fibro body is already challenged in this area, we cannot afford additional challenges. 9. Time for a new mattress? It’s an easy thing to put off. 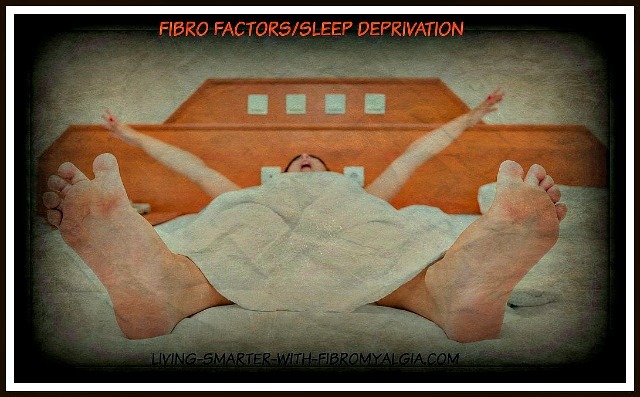 Yet, a worn mattress can create more pain and symptoms for the fibro body. However, we must be careful about chemicals in a mattress. We are in too close proximity to be exposed to potential chemicals from a mattress. Conventional foam and other materials may not be the best choice. Glues and other sealants can also pose a problem. In my case, I had to go with natural organic materials for my mattress because I have reacted to chemicals since a young age. Be sure to also avoid using chemical detergents on sheets and pillowcases and of course on clothing with which we are in constant close proximity. These are both stimulants and endocrine disruptors. Also for the bed, consider weighted blankets which have been shown to help calm the body and/or cervical type neck pillows if needed for extra neck support. 10. Staying in the house, working at home: When living with a chronic illness, many people will either stay at home or work from home. The only problem here is that staying at home too much can also affect our ability to sleep. Women already have a greater propensity for sleep problems so when we add fibromyalgia to the equation, we now have a greater challenge. A sleep help suggestion is to avoid taking naps too often or try to limit the time and duration. And yes, not working outside the home can be a detriment to healthy sleeping patterns. Do whatever it takes to avoid this pitfall by at least adhering to a structured schedule when working from or staying at home. Using a written daytimer is essential. Have a formal schedule for each day. 11. What about hormones? Imbalance, estrogen dominance or lack of hormones can affect sleep and relaxation. Peri-menopause can cause issues with estrogen dominance. Maybe we have had a hysterectomy and no longer make our own hormones. Hormone imbalance can surely exacerbate fibromyalgia symptoms. Bio-identical hormones can aid in balance while addressing other side effects such as hot flashes which directly affect the ability to get a good night’s sleep. In my case, I found that taking bio-identical progesterone in the evening before bed helped with relaxation and overall hormone balance. Of course you must work with your doctor in this area. As a sleep help suggestion, I recommend an endocrinologist / hormone specialist who is objective regarding Bio-identical versus artificial hormones; weigh the pros and cons carefully. Read more here about Fibromyalgia and Hormone Balance. 12. Sugar acts like a stimulant in the body. Fibro bodies are already more sensitive to stimulants in general. Sugar also produces alcohol in the liver and greatly reduces immune status in the body. With any auto immune illness, we are further compromised. All forms of sugar need to be reduced to attain greater levels of immune health. Sugar is a great detriment to our immune health and well-being. My sleep help tip: Choose natural sugars and if needed, a carbohydrate snack before bed can be helpful to prevent adrenaline from increasing during sleep. The brain only needs about 30 grams of “natural sugars” in any given day to thrive, yet many people get 3-4 times that amount every day. 13. Can’t turn the brain off? Your body wants to sleep but your brain is "wired". Do you have symptoms of ADD (attention deficit)? This is very common and very under diagnosed according to Dr. Amen of the Amen Clinic. With any chronic illness and definitely with fibromyalgia, there is often a disruption in body and brain chemicals. This disruption can result in anxiety and the inability to turn off thoughts and experiences from the day. Maybe you are rehashing a conversation or an argument? Maybe you are simply excited or anxious about something in the future. GABA (gamma aminobutyric acid) which is produced in the brain from glutamine and glucose can help to promote the relaxation response. Also, L-Theanine is an amino acid that has been proven to promote relaxation naturally. Also, remember this, as I like to say, "the opposite of wired is tired". So do something that will naturally "tire" your brain, like a study or learning something new before bed. A bible study or anything that requires thought and attention. A clinical trial in Italy looked at the natural supplements magnesium, zinc, and melatonin to improve restorative sleep. Participants took 225 mg of magnesium, 11mg of zinc, and 5 mg of melatonin in a fruit sauce each night before retiring. The participants also wore a sensor to measure the quality of their sleep and the amount of daytime activity. The results showed a forty-five percent improvement in quality of sleep for the test participants compared to a control group. The test subjects also reported finding it easier to fall to sleep, awakening in the morning more alert, improved mood, and generally feeling better throughout the day. The sensor showed significant improvement in sleep time and daytime activity. U.S. Department of Agriculture guidelines. Beyond natural supplements for sleep help, here on the website, I’ve talked in detail about other sleep help methods to deal with anxiety, second winds, adrenal stress, negative emotions and resetting the body clock; sleep help solutions such as meditation, exercise, and deep breathing are offered in the following links. I hope you will follow them to the significant sleep help available to you. Additional links below. Lisa.